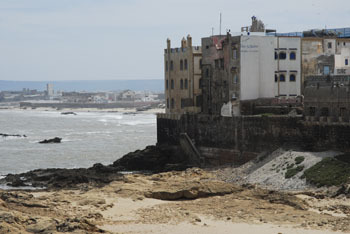 Maps of the medina of Essaouira. 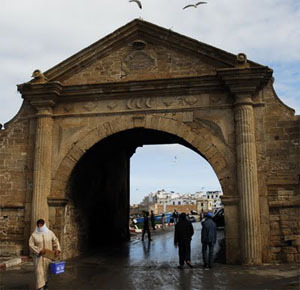 The old town, the "Medina" of Essaouira is walled with several gates. 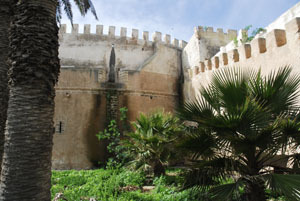 The most precious part is the Kasbah where there was the Sultanate, court house and where we find the old European and Brasilian consulates since the glorious times when Essaouira was a prosperous trading port. The geometrical plan of the medina was influenced by European townplanning. 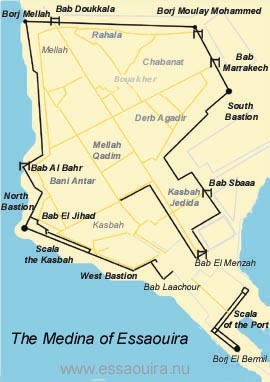 The quarters are separetad by the 2 main axis going from Bab El Menzah to Bab Doukkala and from Bab Marrakech to Bab Al Bahar. When Mellah Qadim (old) was too small there was a new place for the Jews to live at the north corner of the medina at Bab Doukkala. including 'abîd al-Bukhârî (the Sultan's Black slave soldiers) and soldiers from Agadir who were permanently stationed in Mogador. Bab Doukkala was the main door to the north to Safi (the region Doukkala) and Bab Marrakech to the east the road from Marrakech and Agadir and the caravan trade from Africa. 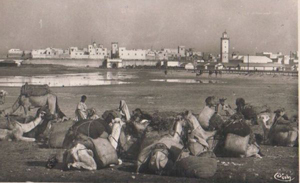 The Medina was fortified with the 2 Scalas under the reign of Sultan Sidi Mohammed Ben Abdallah who founded the new city of Essaouira 1776. Visitors coming by boat entered the medina by the magnificient gateway, Bab El Mersa of Scala the Port and through this door all export and import passed during the golden age of trade. with Bab Al Bahar - an entry to the medina from the sea.